This drawing is simply to show you after all the abstracts that I do, that I can do a traditional rendering or drawing of an animal. I realize that some of you who have seen my work but do not understand “abstract” art wonder if I can “really” draw. 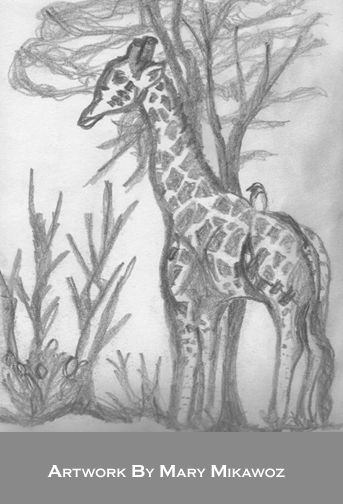 In this case, this is a giraffe with a little bird on its back that I quickly sketched up. I remember a time when my high school art teacher was promoting me doing abstract art and I remember fighting it “tooth and nail” thinking that the person really could not draw. I just did not understand at the time and I was not into experimenting back then or even symbolism as much.